If growth is a measure of success, then the Midtown Arts Center is successfully out of room! In 2006, Eugene Ballet purchased and began renovating the 13,700 square foot building at 1590 Willamette Street in Midtown Eugene. Since then, Midtown Arts Center has provided a home for Eugene Ballet. Eugene Ballet’s long term vision of financially supporting this home included bringing seven additional nonprofit arts organizations under its roof, generating income by keeping rents consistently below commercial rates, and sharing infrastructure and general maintenance costs. Increased interactivity between the organizations was also intended to promote cost savings and enriching collaborations. What began as a novel idea 10 years ago—to bring together seven of Eugene’s signature non-profit arts organizations into one building—has been experienced as a tremendous success for all of the organizations involved. Midtown Arts Center’s successful operational model has contributed to the growth of each organization housed within it. Collectively they have seen a 58% increase in personnel. The Academy’s attendance has increased more than 40%. In addition, programs created by these organizations extend beyond the Center’s walls, serving further into the community with educational outreach, in-school residencies, rural touring initiatives and increased number of performances. This lively arts space has served its occupants well as each organization has evolved and grown, eventually creating the need for additional space. To strengthen the foundations of each organization, allowing them to push their resources further afield to increase access to the arts, Eugene Ballet is looking to reinvest its current equity and experiences of the past 10 years into a new, expanded and permanent home. Now there is an opportunity to lift this success to the next level by assuring that the future growth of these organizations is limited not by the size of their facility, but only by the reach of their vision. This project has the potential to lift the success of the original Midtown Arts Center to the next level by helping to assure that the future growth of these organizations are limited not by the size of their facility, but only by the reach of their vision. 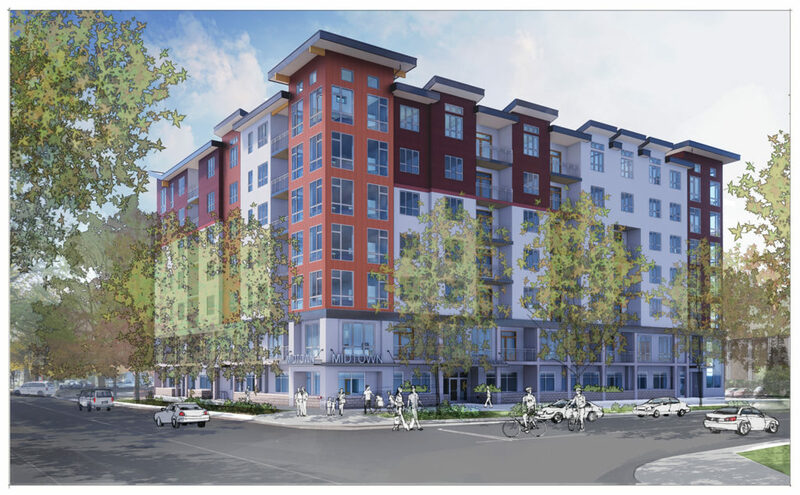 The completed project will provide new housing, vibrancy and arts engagement to Eugene’s Midtown, catalyzing adjacent development, restaurants and street life, and enhancing the quality of living in this area. Eugene Ballet is working with Alex Haugland, a longtime supporter of Eugene’s local performing arts groups, and a team which includes Dustrud Architecture, Essex Construction and Eugene Commercial Property Management, to redevelop a 20,000 square-foot parcel of land at 16th Avenue and Pearl Street into a mixed-use commercial condominium project that combines expanded nonprofit spaces for the Midtown Arts Center on the first two floors with privately-owned apartments, townhouses and condominiums on the floors above. This opportunity allows Eugene Ballet to own a new permanent home designed specifically to expand the capacity of its Academy while also providing increased accessibility to valuable rehearsal spaces for Eugene Ballet and other Eugene nonprofit arts organizations. The Balboa Theater in San Diego is a building dating back to 1924 that included a “wrap” of office spaces around the exterior of the theater. The New York City Ballet and the School of American Ballet are currently housed in the lower floors of a luxury apartment building. 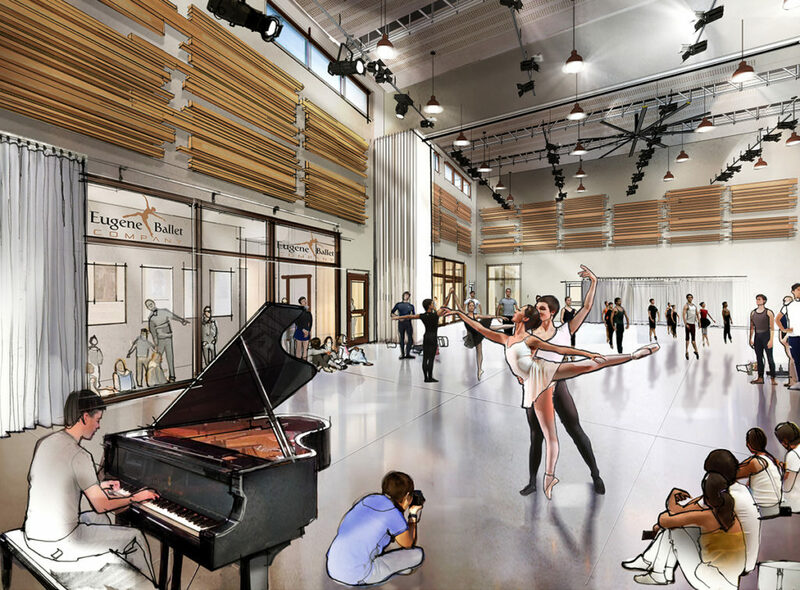 Since the apartments and condominiums are being funded by Alex Haugland and additional private investors, Eugene Ballet will only be responsible to raise the funds necessary to purchase and build out the portion of the building allocated for the New Midtown Arts Center. Eugene Ballet will provide more than 50% of those funds through the sale of its current property, where Eugene Ballet will remain until completion of the project, anticipated in the spring of 2019. Eugene Ballet will own the New Midtown Arts Center portion of the completed building. The arts organizations currently renting from Eugene Ballet have all expressed the desire to continue their arrangement in the new building. Increased access to dance studio space for an additional 150–200 children and 50–100 adults. Increased office, rehearsal and program development spaces for the current and future potential nonprofit arts organizations. Additional jobs for 150+ local workers during the construction and build out. Additional growth potential for 20 new positions within the nonprofit arts organizations. YES, I want to invest in the growth of the Arts in Eugene! If you have questions or would like to discuss your pledge in person, please contact Eugene Ballet Development Coordinator Lisa Bostwick at 541-485-3992 or [email protected].